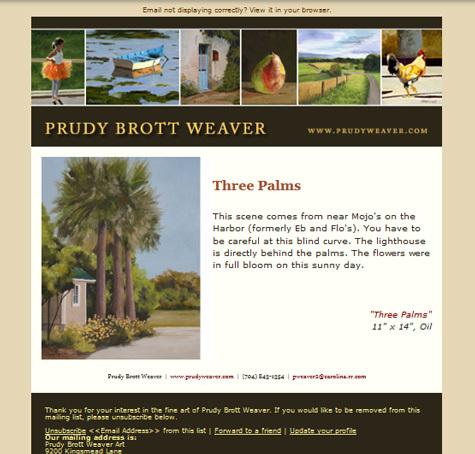 I just scheduled the 100th edition of Prudy Weaver's weekly emails, in which she shares a photo of recent work and a bit of the story behind it. Her readership has consistently grown over the 2.5 years we've been publishing these updates, which auto-post to her Facebook page. 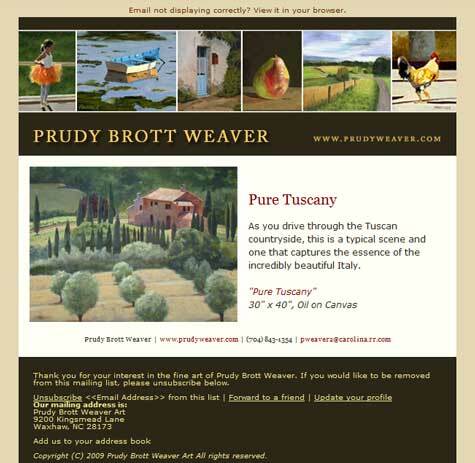 I just finished preparing another round of emails for artist client Prudy Weaver. For a couple years now we have been sending new paintings with a brief description in a weekly email to her followers. Mailchimp makes it easy to design and schedule emails in advance and auto-post them to Facebook. Here's a peek at one of Prudy's recent emails. She does beautiful work and some of the best that I have seen are coming up in the next few weeks' emails. You can subscribe to her list here.